Winslow Reef has been one of the biggest mysteries of the Phoenix Islands, with very little known about it. None of the missions to explore the Phoenix Islands related to PIPA have made it into the water up here, in the northwest corner of the area. So as we ventured up into that area, we had no idea what to expect. Captain Winslow, aboard his whaling ship Phoenix, charted some of this area in 1851 and another vessel made another set of depth measurements in 1944. Both of their measurements of the shallows of the reefs, areas we should be extra wary of were made using celestial measurements, not as precise a measurement as we needed for detecting the reef shallows they found so long ago. Because of this we proceeded very cautiously, constantly checking the depth by all means possible on the ship. We conducted a few stations around the outskirts of it, circling around, trying to get a sense of the reef. Seemingly by a stroke of luck we found a shallow, sandy area we could anchor at on Wednesday night. 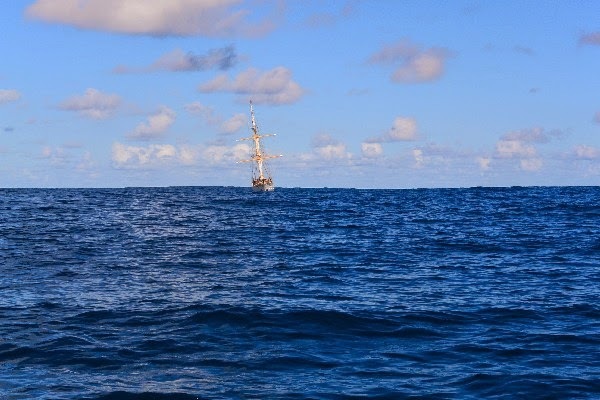 Whether it was the one mentioned in 1944 or a separate one we found is impossible to say, but either way we were all totally surprised with the outcome of being anchored in the middle of the Pacific Ocean. Previously unseen bottom of Winslow Reef, approximately 30 meters from the surface. Winslow Reef didn't seem like much at first. There is no emergent land, as was reported in 1851. We did not see an especially large number of seabirds or any fishing vessels, two changes we thought we might see in this area. But being anchored in the middle Pacific Ocean with no land in sight is a pretty cool thing. Later in the evening on Wednesday our shark researcher went out fishing to see what they could find, not really expecting much. Because the plateau of shallower water we found was a pretty small area, they stayed pretty close to the ship, giving us our best view yet of what they were up to. We saw them pull up shark after shark, mostly grey reefs, and even a large ray that they were able to put a satellite tag on. This was encouraging for what we might find below the surface of the water so we prepared to send snorkel missions out in the morning, likely the first ever in Winslow Reef. Once we got in the water it was clear Winslow was different than the other reefs we have visited. 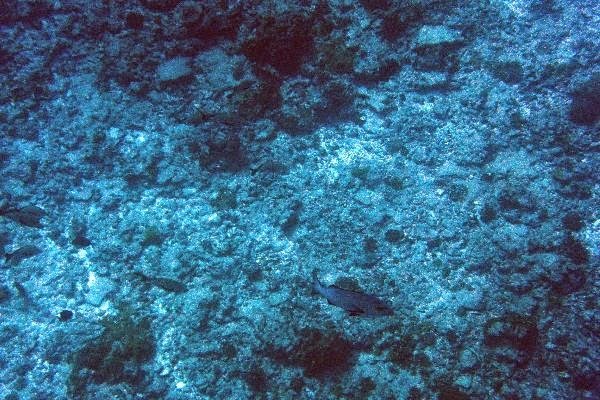 There was not a lot of coral cover, mostly just a few heads a couple of decades old. It was all pretty flat with almost no vertical structure to the coral. Afterwards we discussed how during the last glacial maximum, Winslow Reef would have been above water, just like all the Phoenix Islands. However for some reason, the coral growth here was not able to keep up with rise in sea level over the past 14,000 years and the coral has slowly been degrading. Despite all of this it was really cool to be part of the first group here to document what we found, see the reef and photograph what we saw. We saw lots of reef sharks and rays, a good amount of fish, including a couple huge schools of fish, an order of magnitude larger than anything I had seen at any of the other islands. More than anything it was surreal to anchor and snorkel in the middle of the Pacific Ocean. We are entering the final stretch of our time in PIPA, heading towards Nikumaroro. We plan to arrive on the 2nd and spend three days there before leaving and heading towards American Samoa.